see All Rolando's Fracture codes. Pilon type fracture of the thumb metacarpal base usually into T or Y configurations. Generally results from axial loads. Anterior oblique ligament remains attached to fracture fragment. CT: consider for pre-operative eval of comminution. 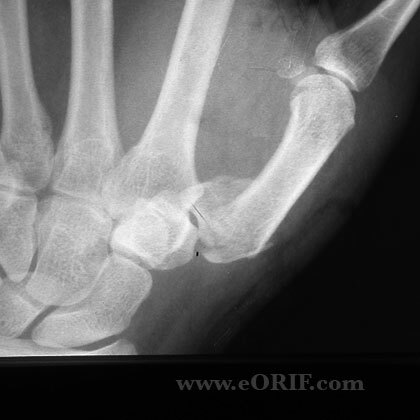 3-part Rolando fracture: ORIF with multiple Kirschner pins or plate +/-bone graft. 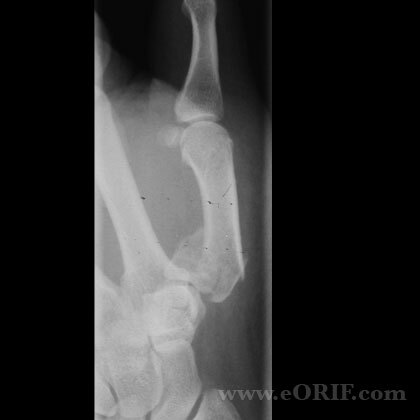 1Yr: f/u xrays, Assess outcome. Consider trapeziometacarpal arthrodesis for persistant pain with radiographic evidence of articular incongruity.